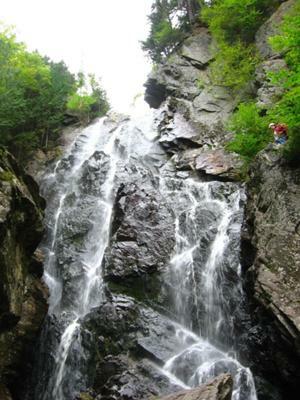 This is a big falls--a short but beautiful hike and a little complicated for us to find. In fact, we ended up stumbling on it when we camped at Cathedral Pines in Eustis, Maine a few years ago. You drive up a mountain nearby and the falls are somewhere on top of it. We followed a moose calf that wouldn't get out of the road for about 200 yards; he just ambled along in front of us without a care in the world. . . I agree--Angel Falls is a very special and magical place. Although my photo doesn't really represent it well, as it was fully clouded over when we went--yicky skies!